Which Do You Prefer White Or Brown Bread? Discussion in Food & Drink started by lucykey • Nov 4, 2017. Everyone has a different taste of bread that they prefer over others. This makes it possible to choose from the available varieties. I prefer using brown bread because of it having less starch as does the white bread. It also boosts my health tips and it has the real taste. Do you prefer brown or white bread? I think I will go for brown bread. It is a whole meal, it is digested slowly hence releases less sugar in blood. It also contains lots of fiber that add bulk to food and prevent constipation problems. It is also not too much sweet. Too much sugary/sweet foods are not that healthy. I'll always prefer white bread because I think it's healthier and tastier (and considering the financial issue, they are cheaper than the brown ones). I prefer brown bread because it is supposed to be healthier. As a kid I loved the white bread, but those days in which I could eat anything without remorse are long gone. Also, it is easier to handle because it is firmer than white bread. The only time of the day I allow myself some withe bread is in the morning with a little bit of butter and maple syrup because I really enjoy the taste of them altogether. I do not eat much bread at all; but when I do eat bread, it is always 100% whole wheat bread, or one with mixed grains and added fiber. The one that I like the best is the Good Seeds bread that is put out by Dave’s Killer Bread. We buy it when we go to Sam’s Club, and even there it is very expensive, so mostly i leave it for my husband to eat since he likes sandwiches, or just bread and peanut butter in the evenings. What I usually eat in place of bread is either flax pita bread or Flatout flat bread. Both are much lower in carbs and very high in fiber, plus flax seeds have the omega 3 oils which are so important to our health. When you toast the pita bread in a frying pan with a little coconut oil, it is delicious ! I sometimes have this for lunch with some melted cheese (almost like a grilled cheese sandwich) and sometimes, I add an egg to that and it makes a quick and delicious breakfast meal. Personally, my favorite bread is something called "Sunflower Honey Seeded" bread, and it's this off-white color, but when I check the ingredients, it's made from whole wheat (WHICH IS EXCELLENT) and I'm always happy to see that when buying rice, noodles, or bread. It goes great with turkey and cheddar. There are so many seeds in this bread, they're even baked in the center (not just in the crust.) If I can't find that bread, because people usually buy it all out by the end of the morning, I like regular whole wheat bread or whole wheat honey bread - both brown. I'm allergic to honey, but don't seem to have a problem with the small amount they put in the honey wheat or even the Sunflower Honey Seeded bread. You know what...I can't tell any difference in taste of white or brown bread. There is oat breads that is so much more costly but much more healthier. Funny though the ones on sale that go for 2.00 or 2.19 a loaf has fructose in it which I try to keep away from, but they are cheap. 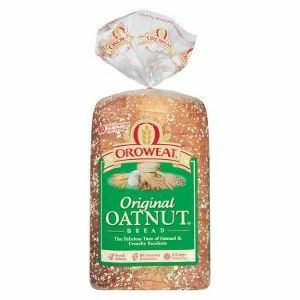 I love those oat breads that is denser and has a slightly sweeter taste, is brown in color too,but pricey. I live near Love's Bakery and their Thrift Shop, so I go there and get bread and pastries cheaper. At the Love's Thrift Shop they sell fresh bread cheaper too, so I'll pick up some loaves of Oat breads when available. I like these breads because they're healthier too. 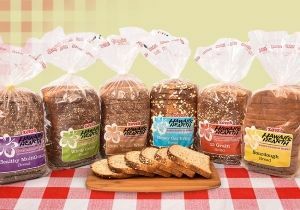 I also love these Hawaii's Hearth Breads, pricey too, lol. I eat both actually. For toasted sandwich, I prefer white bread and for wholesome meals with less fat, I prefer to use brown bread. Although I only use the seeded brown bread. Plain brown bread is not tasty at all. I eat both white and brown bread, However, I mostly go for the brown bread because in my opinion it's more tastier than the white bread and I am also aware that it should be the healthier of the two. There was a hype on brown bread a decade or 2 ago that pushed the price of brown bread higher than white bread. The hype claims that brown bread is m7ch healthier to eat. For me, bread is bread be it white or brown and I don't believe in such hype. My usual question is this - will you reach 100 years if you eat healthy foods? I would rather enjoy my life by eating what pleases my taste buds. Personally, I prefer the white bread, I cannot eat the brown one. I know that the brown bread is healthier and in some cases, it contains potatoes and will have no sugar at all but it has a different taste than the white bread that I cannot stand it. My father eats brown bread for medical reasons, he doesn't like it either. I prefer white bread as it has a better taste and it is quite cheaper. I tend to buy white bread that has added milk in it because it is known to be healthier than once that don't have any. For some reason I don't really enjoy the wheat taste especially when I am eating a sandwich, to me it's not the same. I usually eat bread in the morning. Whenever I go to the store, I prioritize brown bread over the white one. To begin with, brown bread is more nutritious and it is also bulky. I usually feel full after eating it. Another thing is that brown bread will always be cheaper than its white counterpart. Hence, I save more. It is the opposite here, and white bread is a whole lot cheaper than brown bread, except for the really cheap-quality breads, and then they are often the same price. However, those are not truly a bread made with healthy whole wheat, they are simply white bread colored brown. White bread is made from white flour so chemically bleached and processed that there is really no nutrition left in it. Some of the brown bread has very little whole wheat flour, and it is important to look for brands that say “100% whole wheat” so that you know that you are ectually getting bread with some of the natural health benefits in it. I have read before that brown bread is much healthier than the white ones. Most of the brown bread I had are wheat bread. Though, I am more into eating white because of its availability in the market and the local store around me only sell white bread. So, I do not have quite a choice. But, I would really love to eat brown ones since it's healthier. I think it depends more on the texture than the color or style to me, but more often than not the browner bread is usually better. Sometimes though plain old white bread is kind of appealing. I eat brown and white bread but I always go for the white bread, I know that brown bread is healthier than the white ones but I just like the white bread better. I prefer white bread over brown bread. Brown bread is indeed healthier, but white bread is more tastier and delicious than brown bread. @lucykey I can eat both white and brown bread but I prefer brown bread more. White bread is tasteless to me when plain unless I apply margarine. I can eat plain brown bread everyday without getting bored with it. Brown bread is a healthy meal for breakfast and I like having it with plain milk.